Burlington Cops Show Students the Ropes at Junior Police Academy | Features | Kids VT - small people, big ideas! 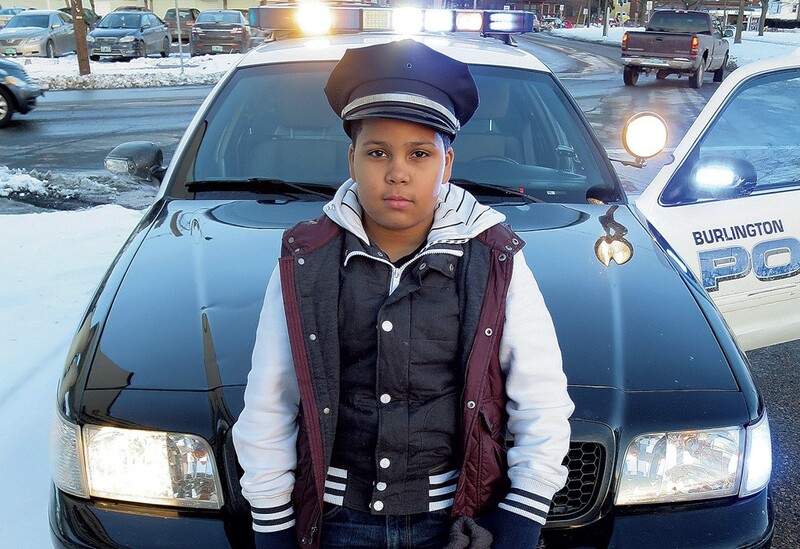 Javain Headley checks out a Burlington police cruiser. 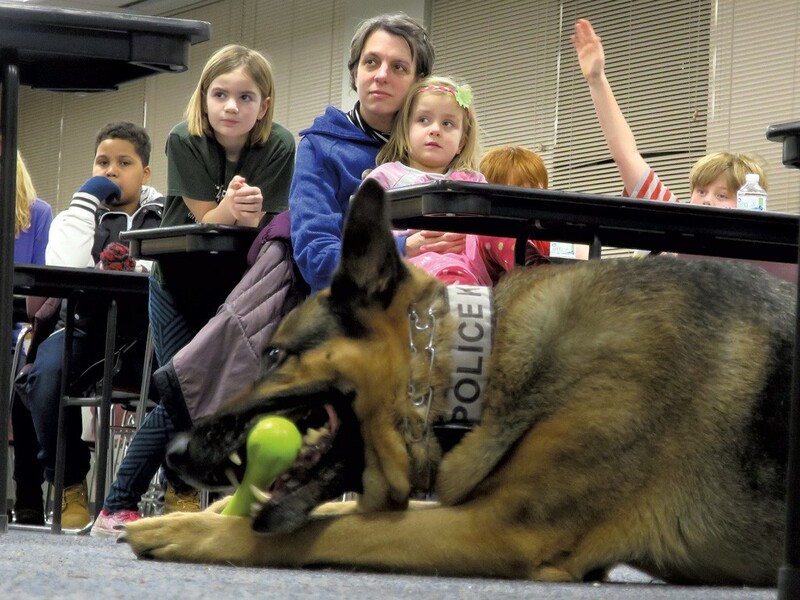 The 14 children gathered in the Burlington Police Department's community room last January all seemed to have the same thing on their minds: When do we get to meet the police dog? The kids asked that question several times during a late-afternoon session of the Burlington Junior Community Police Academy. The free program is in its second year, and gives Burlington residents ages 8 to 15 the opportunity to meet local police officers and learn more about their work. For about an hour a week throughout the month of January, kids get to tour police facilities, learn about crime scene investigations, climb aboard police vehicles and try out other crime-fighting tools. "I'm ready for the zombie invasion!" 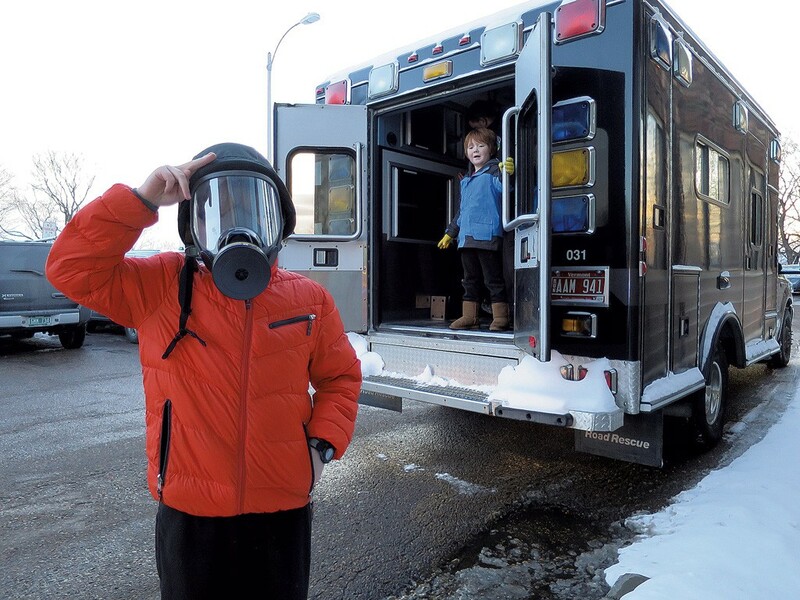 announced Rob Safran, trying on a police gas mask outside the Burlington Police Department's tactical platform vehicle. The program got its start after a 10-year-old Burlington girl learned about a community police academy for adults that her grandmother attended, and asked then-police chief Michael Schirling if he'd create something similar for kids. He obliged. 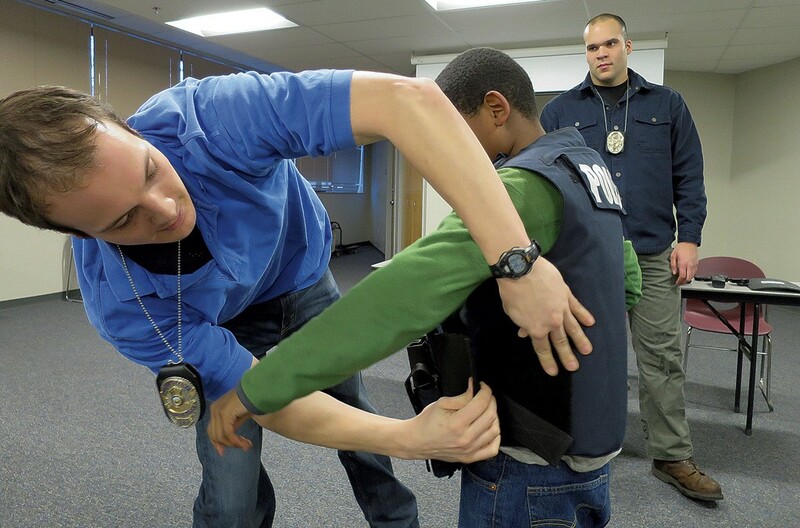 At a time when kids' and teens' interactions with police sometimes make national news due to their confrontational and even tragic outcomes, Burlington's junior community police academy helps kids and cops connect in a safe, friendly and fun environment. On this particular afternoon, the group's third session, the kids got plenty of hands-on experience trying out police equipment — minus their weapons, of course — including handcuffs, helmets, radios, riot shields, and the lights and sirens on a police cruiser. Until the police dog arrived, Officers Philip Tremblay and Daniel Delgado kept the kids occupied, and vice versa, with questions about the various tools of their trade. "What's this vest made of?" this boy asked. "Kryptonite," said Officer Daniel Delgado (right), straight-faced. "So, does anyone know what we use the radio for?" Tremblay asked. "To take breaks if you have to go to the bathroom?" one boy answered. 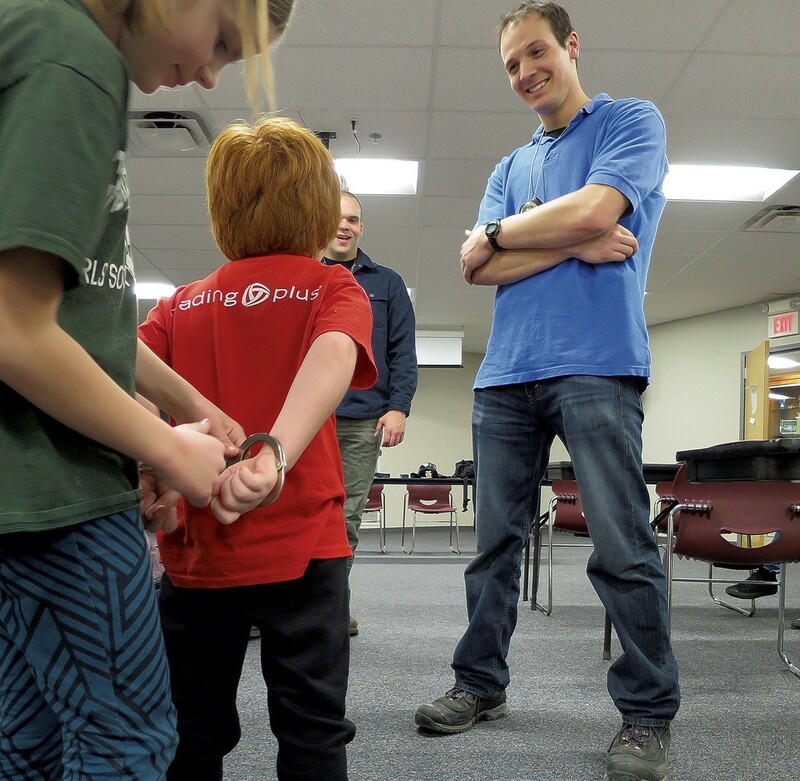 Lincoln Safran gets handcuffed by a fellow student as Officer Phillip Tremblay looks on. "Yes, exactly," Tremblay said. "Anyone else?" "To call another police if you need help," one girl suggested. "Or, if you have a mini toilet on your vest and you're missing one and you need to go to the bathroom and you need to call for a new mini toilet?" said the first boy. "Hmm, I've never run into that situation," Delgado mused, "but that's absolutely possible." "Are you guys on the squat team?" asked another boy. "No, we're not on the SWAT team," Delgado clarified. Shortly before class ended, Corporal Trent Martin and his K9, a 9-year-old German shepherd named Capone, arrived. For the remaining 20 minutes, Martin taught the kids how to read the "language of dogs" and how to approach an unfamiliar dog. Never run away from one if it's growling or barking, he advised, as it can trigger the dog's predatory chase instinct. Then, after a brief demonstration of Capone's drug-sniffing abilities — the dog quickly located a cache of narcotics hidden in a fire-extinguisher case — Martin showed the group how he trains Capone to attack. Using a verbal command, Martin ordered the dog to attack Delgado, who was wearing a special burlap bite sleeve to protect his arm. K9 Capone, a 9-year-old drug-sniffing patrol dog, has been with the Burlington Police Department since 2008 and is one of its most effective community ambassadors. Capone quickly ripped off the sleeve, then paraded playfully around the room with it in his mouth as the kids laughed and cheered. Said one girl, "He doesn't look that mean." "He's not," Martin reassured her, as she scratched the dog on his chest. 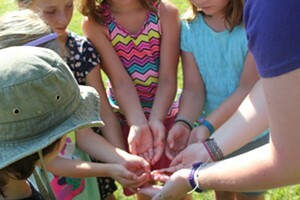 For information about future Junior Community Police Academies, contact Kimberly Caron at kcaron@bpdvt.org or visit burlingtonvt.gov/police.